In many ways, Iron Man 3 is thoroughly typical. It is a movie about a hero who has a girlfriend, a sidekick, a best friend, unlimited financial resources, and a mission laid out before him that only he can accomplish. By the time it is over, it has hit all the notes: our hero is unhappy, then he is happy. He starts out one way, then something happens to him and he ends up another way. Good triumphs, and crime does not pay. What is so interesting about Iron Man 3 is how atypically it goes about being typical. The film manages to be surprising while at the same time never venturing outside the conventions of its genre. Indeed, it even makes fun of those conventions while at the same time fulfilling them. It’s quite the trick. Writer and director Shane Black probably has a lot to do with that. The writer of the original Lethal Weapon, The Last Boy Scout, and The Long Kiss Goodnight knows as much as anybody about how to give people the goods and have fun doing it. He has tried to play with these conventions before, in Arnold Schwarzenegger’s legendary bomb Last Action Hero, a film that got too meta for its own good. Here, he gets it right. Every time you expect Iron Man 3 to enter formula, it just doesn’t. Something entirely unexpected happens, and you’re left struggling to process everything that’s going on, and by the time you catch up and realize the scene you watched is actually nothing enormously special, it’s time for the next one. 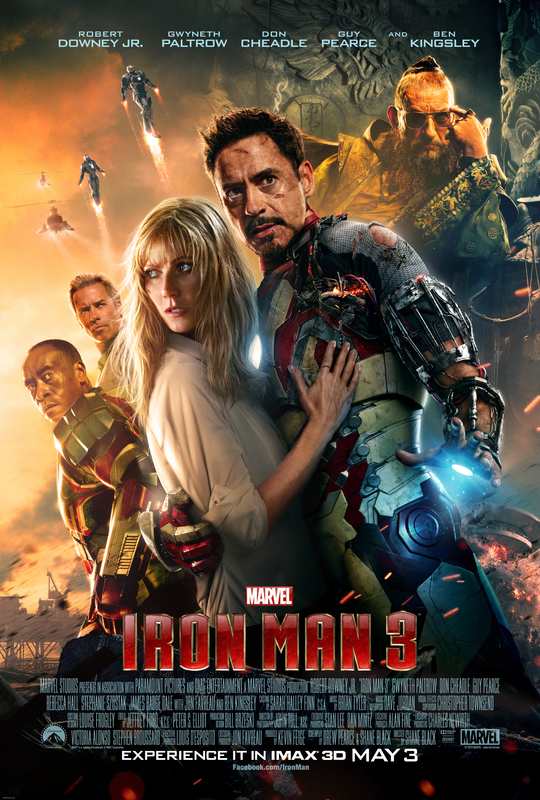 Iron Man 3 is a mythic story of a high-flying hero playing out in the same world where a passing car splashes mud all over you. Every scene of Iron Man 3 is a series of assumptions, reversals, and improvisations on the parts of characters making do with an imperfect situation, with no delusions that things are otherwise. Iron Man jets through the sky, but he also runs out of juice and has to hook himself to a car battery for a while. Tony Stark is helped out by a young boy with no father, straight out of Spielberg, but Stark tells him not be such a baby about it, because Stark is kind of a callous jerk and that’s what he would probably do in real life. Stark also spends precious little time as Iron Man. Things don’t go his way for most of this movie, and he is forced to be creative, showing that this series is not about a suit of armor that flies and shoots things, but about the ingenuity and resilience of Tony Stark as he finds ways to turn failure into success. Iron Man 3 changes absolutely nothing about the superhero film, the summer blockbuster, or the action film. But, like Tony Stark in this film, Shane Black finds ways to take the hand that is given him and play it to its fullest possible potential, coming out far more successful than most would have thought. For that, it’s a triumph.